Terence McKenna said, that the search for higher intelligence is an inner journey– the connection to something greater is immediate and always at hand. I think reason can take us only a certain distance, and then we have to go with the divine imagination. There have been many episodes in the history of science where great hope gave way to paranoia. The [UFO] hysteria has become more explicit and has wandered in first one direction and then another, but if this is a contact it’s the most peculiarly un-contact-like contact it’s possible to imagine. And this is something I’m going to try and convince the UFO community of, what we drug people have that you don’t is repeatability. The Stropharia cubensis mushroom is a memory bank of galactic history. Alien, but full of promise, it throws open a potential for understanding that will sweep away the petty concerns of earth and history-bound humanity. Reason, but a willingness to explore the edges has been [my] method. … I have never seen a violation of physics that was not connected somehow with a psychedelic experience. Not all psychedelics are alike. And this very small family of compounds, called the tryptomine hallucinogens, bear careful examination if we’re seriously interested in this question of extraterrestial penetration of the human world. Everybody knows this who has to do with this stuff [psilocybin], Gordon Wasson, Richard Shulties, Albert Hofmann, the giants know that this stuff is animate. This is not a drug. It’s something that’s disguising itself as a drug in order not to spread alarm. I think that the alien will be so alien that your jaw will hang in the air. And expecting to meet an anthropoid-like alien with an interest in your reproductive machinery and gross industrial capacity is as culture-bound a concept as searching NGC-321 for a good Italian restaurant. It’s absurd on the face of it. All of human history is the signifier of the presence of the alien. Human history is what happens to an advance animal species when it is inner-penetrated on a scale of a million years by a mind in another dimension. 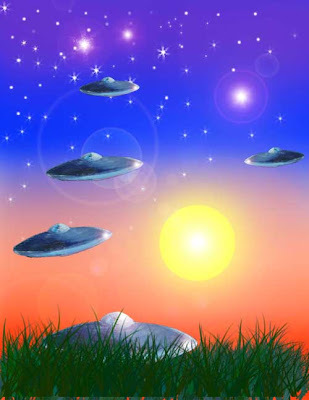 The flying saucer, the alien, the other is what is sculpting us out of animal organization as we move toward it in time. This is what shamanism is all about. This is what the psychedelic people are discovering as they descend into these trances. A shaman, and a psychedelic person, and a UFO contactee, is someone who has seen the end. They simply didn’t know what they were looking at, because who knows what the end looks like. Psychedelic drugs are as important to the study of UFOs as the telescope was to the re-defining of astronomy. I think that the ‘real other’ need not be guarded by the frail efforts of a cults apologists. Now you may have thought telepathy was you hearing somebody else think. Apparently, that’s not what telepathy is. Telepathy is you seeing what somebody else means. It’s the visual acquisition of meaning rather than the audio acquisition of meaning. I think that we are on a collision course with a planet-transforming event, and that we have been for a very, very long time. I also believe that it lies below the horizon of rational apprehension at this point in time. That’s where the frontier of this hyper-technical fantasy is headed, toward a revivification of knowledge systems that were ancient when the pyramids were not yet even a gleam in the eye. I think we’re on the brink of a tremendous evolutionary adventure, and that it will involve physically re-designing ourselves. Download the Podcast by Terence McKenna from "Matrix Masters" ( The Psychedelic Salon ) !